Screaming with laughter and fun, Monsters University, produced by Pixar Animation Studio and released by Walt Disney Pictures, definitely ignites another climax in 2013 comedy film industry. Since first release on June 5, it has grossed $724 million totally at the box office. And the sales of the movie DVD that was released on October 29, 2013 are in full swing on Amazon.com. For DVD fans who want to keep your beloved DVD discs intact forever, it would be a good choice to copy Monsters University DVD to hard drive for playback without worrying about any damage or scratch. You may think that it is just a piece of cake to backup Monsters University DVD with so many DVD copy software flooding over the market. Actually, things always go athwart. As we know, almost all DVDs released by Disney are encoded with latest DVD protection strategy to prevent piracy. Therefore, common DVD copy software may break down when converting the DVD, even the well-known program Handbrake could be no exception. Then which software is the best one to rip and copy the DVD movie without difficultly? To be honest, MacX DVD Ripper Pro would be your solid choice. As the best Monsters University DVD ripper, this software can not only parry any DVD copy protection measures including Disney new copy protection, region code, CSS, RCE, Sony ArccOS, UOPs etc, but also can backup Monsters University DVD with original video quality. Besides the outstanding DVD encrypting and backup feature, this Monsters University DVD ripper is also proficient at converting DVD to AVI, MP4, MOV, FLV etc and iPhone XS/XR/X/8/7/6S, iPad Pro/mini/Air, Samsung, Huawei, HTC, Windows and other devices within a few minutes. Therefore, you can enjoy cherished DVD movies anytime anywhere. Notes: MacX DVD Ripper Pro is specially designed to copy and rip Monsters University DVD on Mac OS (Mojave included). For Windows users, please switch to the Windows version of this DVD ripper to rip and backup Monsters University DVD on PC. Step 1: Run this DVD ripper on Mac and then click "DVD Disc" button to import the DVD. Step 2: Select the output format as you desire from the pop-down box. 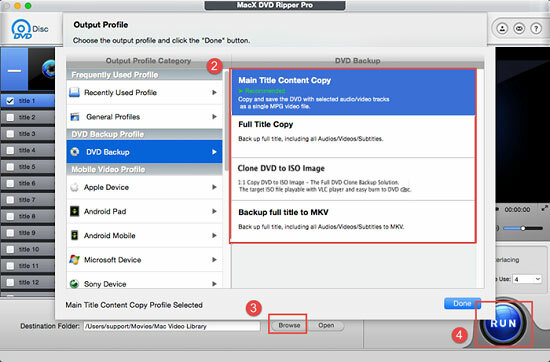 Hit "DVD Backup" button to make a perfect copy of DVD movie on Mac. You can choose to copy DVD to ISO image, backup DVD to MKV, make main content or full title copy of Monsters University DVD on your Mac. Tips: As a bonus, the video editing feature of this Monsters University DVD ripper also enables you to remove unwanted part from the movie, crop frame size, combine separate movie titles into a single one, add external subtitle to the video, etc, so that you can make personalized video library and show off to your friends. Step 3: Click "Browse" button to choose the path where you want to save the output files in. Step 4: Click "RUN" to start copying Monsters University DVD on your Mac computer. You can also view the conversion progress and are able to cancel the converting process at anytime. Besides ripping Monsters University DVD on Mac, this DVD ripper also provides perfect solution to backup and rip other copy protected DVD movies like Zero Dark Thirty, etc with fast speed and superb video quality. This article lists top 10 classic Oscar awarded movies of all time you cannot miss including Titanic, Life of Pi, Forrest Gump, Avatar, etc. With the best academy award movies, you can enjoy a wonderful time with your family and kids on no matter holiday or spare time. Note: The software developer calls for ripping or copying DVD under the concept of Fair Use and does not encourage any illegal reproduction or distribution of copyrighted content. Please abide by the local DVD copyright law before doing it.